Rise and shine every morning I head out to work wearing my suit and tie to be the best I can in coaching my team of professional sales representatives to be the best they can. I travel 75% of the time for this job, and after 31 years doing it, still love it! The rest of my time is consumed being a husband and father, and film making with my two pals Rami and John at Red Rocket Films. Throughout the past 10 years or so, we’ve made short films, music videos and even a full length film. Each one was very successful, and done literally on the fly. I wear many hats at RRF. All involve non-stop critical thinking and a high degree of creativity. I called this article “Being Hyde” because those who know me at work would never imagine who I’m able to become (Mr. Hyde) during film making. It’s a different type of sophistication and environment… although both jobs involve finding solutions to the impossible, working with an extremely tight budget, and collaboration with your teammates. Our latest adventure is working on the preliminaries of a swamp killer horror picture show. Even though it was my original idea to to change genres to horror for our next project, Rami didn’t seem to care about my idea to do a horror movie involving little “Chucky-like” clowns. You see, I thought of this while we were out in the Florida Everglades on premier night of “Shotgun,” but Rami was more fascinated with gators and snakes. I went with the flow on this one, as we all literally do anyway, as ideas evolved into a swamp creature main character driven storyline. The way our team works is that we text each other spaghetti ideas all day long. NOW HERE IS WHERE THE MAGIC BEGINS: Although we deeply love and respect our friendship and teamwork each step of the way, the three of us also bust each other’s balls all day long every day. And since I’m the one the that works for free, I don’t take crap from anyone! Fun, right? Absolutely! So Rami sends me a text… “Can you make a mask for the swamp creature?” I reply, “Dude, come up with the story and character and I’ll figure it out.” I can’t even tell you how many texts followed shortly thereafter with suggestions, movie clips, and “you think it’s possible?-type of questions.” Well, eventually we narrowed down the idea of creating a mask out of a real animal skull of some kind. We started with a deer, but that seemed like a stupid concept. We then figured since it’s for the swamps, we needed a gator skull. We were actually convinced on that, but when we further visualized the creature in that mask, it was not scary at all. So, I asked my kids and some of their friends what scares them, and guess what?…Clowns! …Swamp Clown, maybe? Again, got no support on that idea. So back to the drawing board. Couple days later, Rami texts me a picture of a horse skull, and asked me if I can make that into a scary mask. Well, we get online, looking at scaled dimensions of the skulls, hoping to find one where a face can fit…not so easy! But we did find something that was affordable and that I could work with. Since I was only going to be in town for a few days this month, Rami special ordered it, and I started creating the creature in my mind. It was very exciting for the team. Well, the skull didn’t arrive when promised by the seller, so Rami and I started searching for a brother skull when we came across an ad of someone selling a wild boar skull. This thing came in two parts, head and jaw, and looked huge. But looked very cool, and something from which I can creatively produce a scary mask. This skull arrived at the same time the horse skull arrived. Both were massive, dirty, smelly, and the boar’s head had maggot larvae in it. They were disgusting, but since I was congested with a cold, I was more than excited with either one. We chose the boar’s skull, eager to get started right away, I took it to the garage and started cutting and chipping away at the backend of the skull to where the character’s face needed to go in. What a mission that was. To make it more difficult, Rami wanted to capture it all for Facebook live. 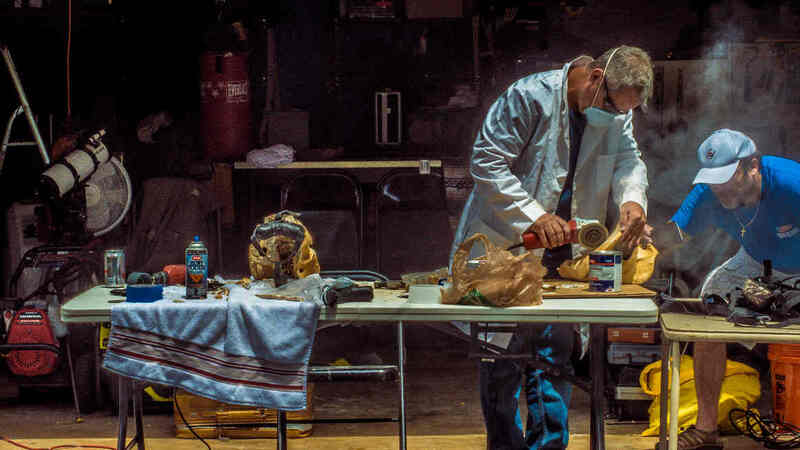 Here I am, on the fly, with my lab coat, Rami’s motorcycle glasses to protect my eyes, an old grinder, dust everywhere, swallowing bone dust full of microbes and who knows what else! The taste in my mouth of bone dust for days afterwards! …all that…and Rami… was frustrating the heck out me trying to capture it on camera. Nevertheless, it was good he did because one viewer suggested I wear a mask, so I got a cheap painters mask Rami had in the garage, but that didn’t help much. Another viewer suggested a chemical mask, which we didn’t have, so I tripled the painters mask. That didn’t help, but my adrenaline wouldn’t let me stop. Part of the skull broke off, but I Bondo’d that together. The next thing I did was to remove unneeded skull matter to reduce weight. There were so many pores with dead larvae, which I needed to shake out and fill the holes with putty. I then removed the tusks from the separate jawbone, made holes on the sides of the boars’ head, and attached the small tusks with Bondo. This creature was finally starting to take shape! Next, I covered the skull in baking soda overnight, hoping to kill the stench. That didn’t work, so I washed everything off with hydrogen peroxide. You’d never guess what that did… it made the skull burst in definition, looking very cool. While it was still wet, I got a makeup sponge and duplicated all those then fading highlights with wood stain. It looked amazing! I knew I wanted to add hair, but wasn’t sure how. I hit YouTube and found how to add hair on latex masks with rubber cement and store bought hair at the beauty shop. With those same techniques I learned at various sites, I more-or-less did the same thing. Wow! The next thing we needed to figure out was how to attach the mask to the face. When we started, I immediately thought of using a catchers mask to do this. It didn’t really fit in the skull opening, so I improvised by cutting some metal off with a grinder. Unfortunately, losing focus for a moment, I cut the wrong thing and the catchers metal frame fell apart. I was, however able to salvage some of it to use, and after what seemed like endless attempts, figured out (with Rami’s input) to Velcro cut portions of his karate gloves to use as steady padding for the face. The straps on the catchers mask were not strong enough to carry the heavy skull, so we recycled baggage straps it its place. Hope you enjoyed a little bit about my background leading me to do what I do, and take the story about how we at Red Rocket Films collaborate to bring fresh and raw original ideas to the screen. By the way, my nickname on the set is “MacGyver”, given to me for my creative problem solving solutions. What I do is not perfect, but I’m always on a limited budget so I do the best I can with stellar results. 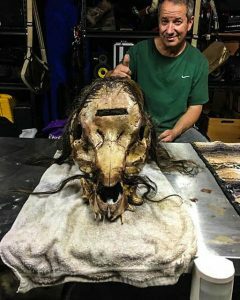 Let me know what you think about the skull, or about any props or effects in our films. All the best to you, and all the best to us!